Carrington completed a glorious treble with a comfortable 3-0 win over Hollins Holme in last night’s Halifax FA Sunday Cup final at the Shay. 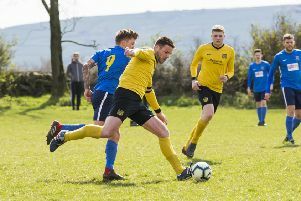 Two days after adding the Senior Cup to their Halifax Sunday League title, Dan Mullaney’s talented side completed a full house of local trophy triumphs. A club which started 10 years ago in humble fashion, with a ninth-placed finish in the bottom division, has become a silverware-winning machine. Mullaney reckoned this was their ninth major trophy success, all in the last five years, and the only mystery is that they have failed to make an impact in the West Riding Sunday Cup. Hollins went into the game looking lambs to the slaughter, having lost the two Premier Division meetings between the sides this season by 7-1 and 10-1. They gave a decent account of themselves but the second goal they conceded in the opening moments of the second half was a body blow to their hopes of an upset. Hollins manager Joel Booth believes their North Halifax rivals are as good a side as he has seen in a 20-year plus connection with the Sunday League. He rates them as good as the Elland AFC team which had a string of title successes when Carrington, who take their name from a now-defunct Elland wire company, were finding their feet. Carrington took only eight minutes to take the lead last night, a lobbed pass through the middle from impressive midfield linchpin Matthew Jones sending Jay Carney away to finish off the inside of an upright. Carney missed a golden chance to double the lead seven minutes later, shooting narrowly wide, before Hollins got a foothold in the game with Ryan Jeffreys’ long throws a potent weapon. George Bamford’s angled shot warmed the hands of Carrington ‘keeper Craig Turnbull and fullback Carlton Pownall cleared off the goal line three minutes before the break from Hollins’ midfield powerhouse Andy Butterworth. Carrington’s neat pass-and-go football always promised to yield more goals but the manner of their second came as a surprise. Two long passes were followed by a cross and Jordan Coduri climbed above a couple of taller defenders to head the ball over Gareth Swain and into the net. Carrington had scored five in the second half against Halifax Hammers in Sunday’s final but they had to settle for one more on this occasion with Chris Garbutt clearing off the line from Leon Hurles-Brook and Carney and Coduri spurning decent opportunities. It came on 71 minutes, Damien Randall scoring with a low, skidding 25-yarder just inside Swain’s right-hand post. Hollins had opportunities of their own but seemed a little shot-shy and Greg Spink’s rather cumbersome turn and effort in the box which went wide, summed up the difference between the sides.